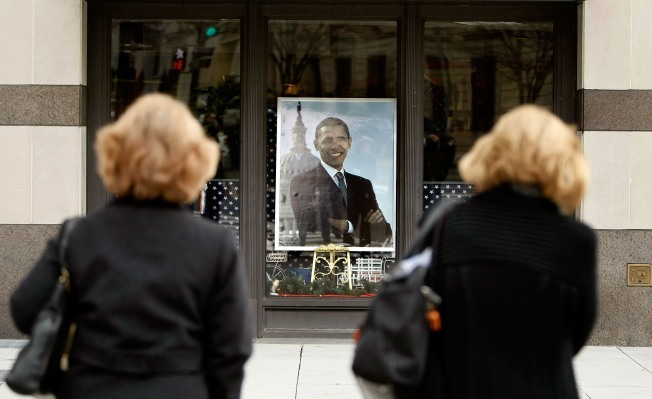 A large photograph of President-elect Barack Obama stands in the front window of Political Americana's inaugural store near the White House December 12, 2008 in Washington, DC. Opening in time for the holidays, the store carries thousands of items including t-shirts, buttons, mugs and golf balls. WASHINGTON -- Even if it looks to be a record crowd at Barack Obama's inauguration, don't expect an official head count for history. A million or more people may show up on the National Mall and along the parade route for the inauguration of the country's first black president, federal and local authorities predict. But officials have no plans to release turnout estimates that day -- or any day, for that matter. "It's a shame," said David Barna, spokesman for the National Park Service. 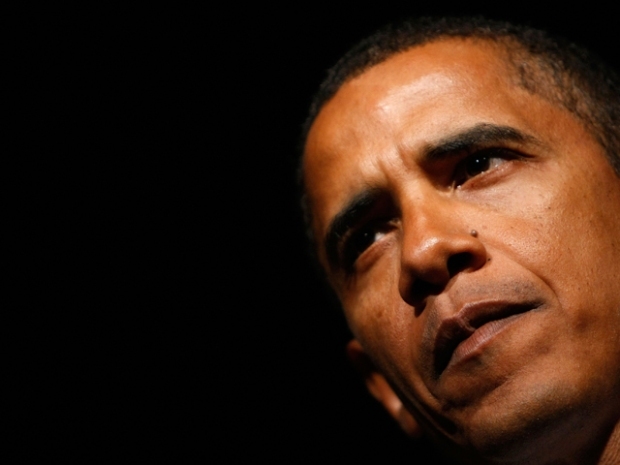 "From a historical standpoint, it's good for America to know the size of the events." Some local lawmakers are calling for an official crowd estimate. "I am an advocate for open and transparent government," D.C. Council member Kwame R. Brown said in a statement Friday. "If there is a way to provide an accurate count of how many people attended this historic inauguration, the information should be made available to the public." Most organizers say that Obama's Jan. 20 inauguration could draw the largest crowd to Washington in modern times. In a hair-raising moment for some inaugural planners, District of Columbia Mayor Adrian M. Fenty said 3 million or more people might show up, more than double the 1.2 million at Lyndon B. Johnson's inauguration in 1965, the largest turnout the Park Service has on record. The Park Service and a number of other agencies have stuck to a more conservative prediction of 1 million or more for Obama. Crowd counts on the National Mall used to be the domain of the Park Service, which analyzed aerial photographs, crowd-density estimates and square-footage figures to come up with approximate turnout for inaugurations, protests and other big gatherings. It started the estimates in the early 1960s but got out of the business after it was accused of underestimating the number of people attending the 1995 Million Man March (as in, not a million). "It's always been a lose-lose situation for the Park Service," Barna said. "You're always criticized for the number you come up with, because the organizers want it to be the largest number you can justify." The Park Service says Congress directed it to stop crowd counts in 1997 to avoid criticism from groups holding events on the Mall and on other property the agency's officers patrol. Park Service officials say they won't change their policy unless Congress advises them otherwise. So far, no other agency seems inclined to count crowds on Inauguration Day. The U.S. Secret Service and D.C. police say they're not going to jump in. And the Presidential Inaugural Committee hasn't shown any interest. "Of all the things we're dealing with ... counting the crowd is not a high priority item for us," said Linda Douglass, the chief inaugural committee spokeswoman. Secret Service spokesman Malcolm Wiley said the dispute over the Million Man March is one reason why a number of law enforcement and public safety agencies no longer give out estimates. After the march, organized by the Nation of Islam, the Park Service estimated that 400,000 people had attended. Farouk El-Baz, a research professor at Boston University hired by ABC's "Good Morning America" to craft an estimate, came up with a range of 670,000 to slightly more than 1 million. But El-Baz acknowledged that photos -- the basis for these analyses -- don't always reflect the total number of attendees because crowds at many outdoor events are moving around a large area, which constantly changes density levels. "You count people at that specific moment in time, that instant when the picture was taken," he said. "You don't know if that was the peak time." If no one steps up to do a scientific estimate, there will only be guesstimates on Inauguration Day, said Clark McPhail, a professor emeritus of sociology at University of Illinois at Urbana-Champaign who has studied crowds since the 1960s. "The word 'million' rolls off the tongue very easily," McPhail said. "Everybody will say this was a very, very large turnout, and you'll have a lot of silly guesses."